Not so long ago, I was contacted by the Independent Newspaper (one of the UK’s biggest papers) to write a feature about wedding traditions and the upcoming Harry and Meghan nuptials. Long story short, I didn’t even get to write the piece, because as sod’s law would have it their email arrived in my inbox on my busiest day of the week ever, when I literally had a morning of back-to-back meetings and by the time I got back to them, they’d found someone else! Oh well! Time waits for no man (or woman), as my mum is forever saying. Anyways, this missed opportunity got me thinking and dreamily wondering about how their ceremony is going to be. Or more to the point how it’s not going to be. I have nothing to base my opinions on whatsoever, but I don’t think Megharry are getting married fully in their own way, but I do think they’re going to do the best with the hand that they’ve been dealt and the duty and the role that they have to fulfil. So I’m basically writing a slight fantasy wedding, the ceremony I think Meghan and Harry would have chosen to have if they had 100% free will over their wedding day. Or perhaps the ceremony they would have wanted, if they were just plain odd Harry and Meghan with no royal ties, no traditional or historical customs to uphold, just two people in love who want to get married in exactly their own way. And now with just over a week to go until their big day, I thought I’d share it here. Oh boy, did I have fun with this. I am of course wildly speculating and perhaps being very presumptive in thinking that Harry and Meghan are not having the ceremony of their dreams, so for the purposes of this post, let’s pretend that they’re not. So here is my alternative version to Harry and Meghan’s real wedding, the way it would have been if I had had the chance to channel rebellious thoughts into Meghan and Harry’s minds. 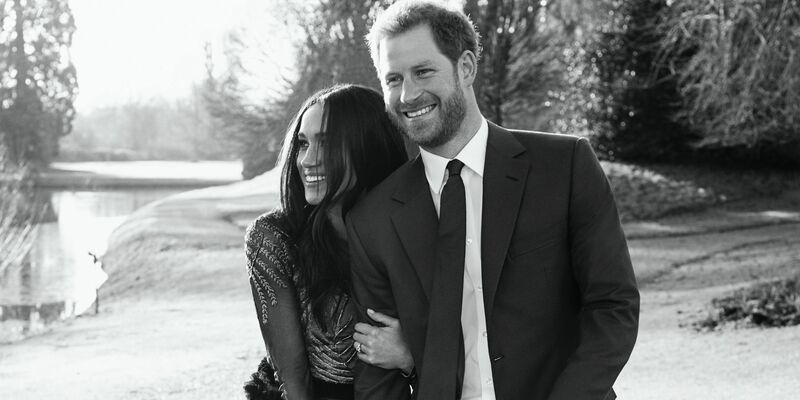 I’m pretty certain that if Megharry had a choice they would not be getting married in a quaint but crumbly chapel on the grounds of Windsor Castle and at the mercy of the British weather, which loves to laugh in the face of anyone who dares to wish for a nice day. I could be wrong, but if you could hire the whole of Richard Branson’s Necker Island, slap bang in the middle of the Caribbean and have all your favourite peeps there, where the sun is shining and the sea looks like a mirror, then most people would want this, wouldn’t they? Well, this is what Harry and Meghan are having in my wedding world. Who the hell wouldn’t want to get married there? I imagine that they would set-up a stunning area down on the beach with the views of the turquoise sea as the backdrop. Now my imagination is going really wild so bear with me. I’m imagining that a local farmer has had to cut down some palm trees for a bit of conservation, so instead of chairs they would have palm trunks laid out at an angle so that everyone is facing inwards, and the trunks would be dressed with comfy white cushions. They also have a rustic arch to frame the sea, which would be dressed with native flowers from around the island and aisle of petals from the same flowers. Meghan will look very boho too. Barefoot, dressed in white because she likes the colour, not because it symbolizes anything, and a nice linen or cotton material. And an all-white flower crown because flower crowns will never go out of fashion. And Harry will be the same. White linen shirt, linen trousers, cool and breezy. Relaxed and chilled. No morning suits here, thank you very much. To go with the casual Caribbean boho theme that I’ve given them, I think that Meghan will forgo an official wedding party and just keep everything simple. She’ll still have her besties by her side throughout the day and perhaps helping her to get ready but as far as having an actually bridal party, there won’t be one. Harry will have his brother William hand over the rings but that will be the only official role of the ceremony by anyone other than themselves. Nice! Harry and Meghan have decided that though they’ll be getting ready separately, they really want to spend a few minutes together before the ceremony starts. ‘This time before the ceremony is so special.This is probably the most amount of time that they wil spend together alone for the whole day, so they’re really going to savor it. It’s also means all those built up emotions will have a nice private outlet before the ceremony, Now don’t get me wrong, the ceremony is going to be super emotional but it just means that initial nervousness and anticipation goes and clears the way for the fun, love vibes to kick in. So after Meghan re-applies her lipstick, because by this point they will have snogged it off, they will start the ceremony. Do you like the sound of a ‘first look’? Read about it here. Oh gosh, this is going to be so good. In my fantasy world, Meghan knows all about the work of awesome Celebrants because she’s been a huge fan of Engaged and Ready for some time now (lol). She’s signed up and receives the newsletters and everything! So because of this they want a really personal and intimate ceremony, so they’ve asked for my help to write a ceremony for them which their close friend will conduct. I told you I was really going for it here! Meghan loves her mum and dad more than anything, and Harry loves his dad and step-mum very much too, but this is a walk that the two of them want to make together. Holding hands, facing life and their future together. And as they do all their guests will stand and applaud them and support their decision to start their journey to marriage together. Harry and Meghan want to really put their energy into expressing their love and honouring all of their friends and family who are present. So their ceremony will really focus on how they met, how they felt when they met and what they want for their future, all whilst evoking the love and warmth from their family and friends. They’ve decided to skip traditional readings but have gone with a community ‘words of wisdom’ element. Because they only have a small group of the nearest and dearest, they asked everyone in advance to prepare a few words of wisdoms about relationships and marriage and everyone would stand to deliver their one-lined wisdoms. Honestly, this element is so cool. You can read about it here. And after that, they’re all going to have a brilliant sing-along, where they’ll all sing Bob Marley’s ‘One love’. Whoop! Do you love the idea of group songs at your wedding? Read about how you can include a group song in your ceremony. As they haven’t seen any symbolic rituals that they love, but because their ceremony is very family oriented they’re going to also have a friends and family vow, and this is what they’ll be asked. “We do”- everyone will shout! And after that, they will have their wedding rings passed around amongst their guests just before they go on to say their vows. For the blessing of the rings, they’re going to have the two rings tied together with a piece of lace. The rings will be passed around hand to hand so that their guests really get to have a deep connection with the rings and can pass their good vibes, love and best wishes directly on to them. You can read about the passing of the rings here. In my fantasy world, there would be no doubts whatsoever that Harry and Meghan would be writing their own vows – no question of it at all! And this would be my idea of the kind of vows that they would say to each other, kindly borrowed from one of my previous couples with a little added Harry and Meghan twist. Harry: I promise to honour the commitments we make today, whether I am far from home or wrapped in your arms. Meghan: I promise to remember how lucky I am to have someone that makes saying goodbye so hard. Harry: I promise to put you before duty and my country. Meghan: I promise to honour our duty and your country. Harry: I promise to give you my undivided attention, as long as there is no rugby on TV. Meghan: I cannot promise that I will always deserve you, but I promise I will try my very best. Harry: I promise to grow old along with you. Meghan: I promise you, me. And at the end of the ceremony, when everyone is on a complete high, all their guests are going to sing Andy Williams ‘Can’t take make my eyes off of you,’ complete with the chorus trumpet sounds too, and literally shout it at them as they walk back up the aisle. Oh my goodness, I want to be a guest at this Royal wedding. Oh shoot, I forgot this isn’t the real wedding, just my fantasy wedding! Oh well, there’s hope for the vow renewal, I suppose. And next week, on the eve of the wedding, I’ll be sharing the wedding stories of lots of gorgeous couples getting married on the same day as Harry and Meghan, as of course, as we know, it’s not just their wedding day!